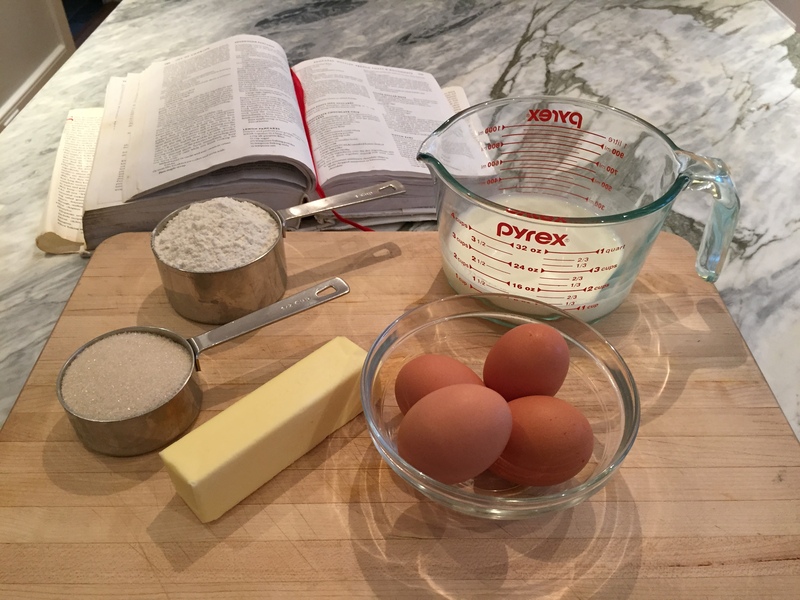 My first post… where to start; what to make?!?! This is a first impression. “You only get one chance to make a good first impression.” Oh, the pressure! Taking this idea of blog from a spark in my mind to an actual functioning website has been quite a learning curve… and I am definitely still learning. At first all I could think about was, “what I am going to make, eat, photograph, write about?” The possibilities are endless and even better, so delicious. Then reality struck… domain names, mapping your domain, blog themes, plug ins, code, pixels. All the behind the scenes that go into creating every single website you visit. And that doesn’t even begin to include the actual content. All of the technical aspects sidelined me for a while. I started to think, “I can’t make the site public, it’s not ready; it’s not perfect; it could be better. But I’ll never think it’s ready, or perfect or couldn’t be better. And that is life- you can’t wait for the perfect moment- because you may be waiting a long time. So here I go! As I said, I’ve been thinking about this blog for a while. Imagining how it will look and feel, and what it will say about me in my kitchen. According to the calendar, it’s Spring, a season of new beginnings, perfect for my new venture. I’ll definitely make something spring inspired, and local. Scrap that, in the northeast, after this winter, we still have snow on the ground. Lots of winter squash and root vegetables to be had… I’ll do something hearty and warm. Fast-forward to a Friday night, I didn’t plan to make this meal my first post, actually I didn’t plan to make this meal at all. We were going to have Baked Ziti with Meat Sauce. Just as I was about to put the dish in the oven, I remembered it was Friday, during Lent, which means no meat for us. Did I mention my son had a buddy over for dinner? And he needed to be home in 30 minutes? A brief moment of panic and then a quick regroup. 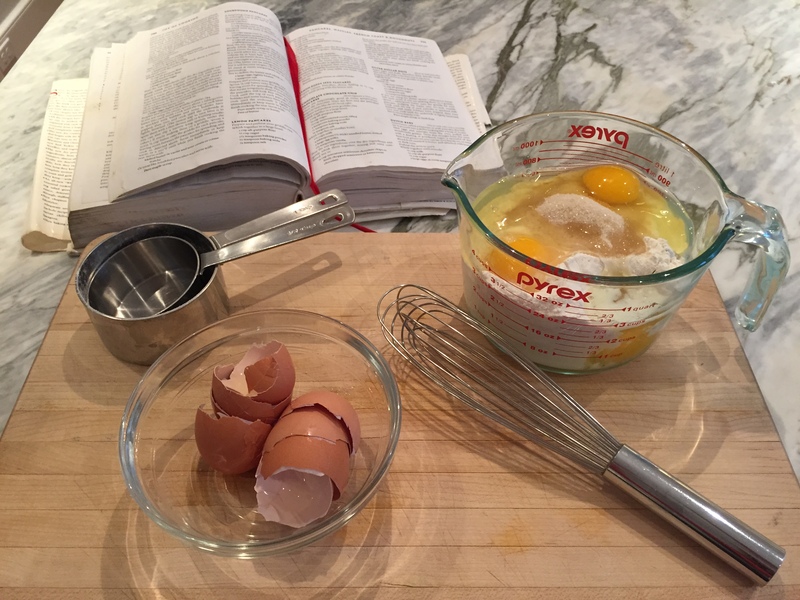 I fell back on an old friend, tried and true… Breakfast for Dinner! We love Breakfast for Dinner in our house, but haven’t been down that road in a while. I did a lot of it when the kids were younger, but not lately. Breakfast for Dinner can mean eggs, pancakes, French toast- it’s fast and you probably have all the necessary ingredients on hand. 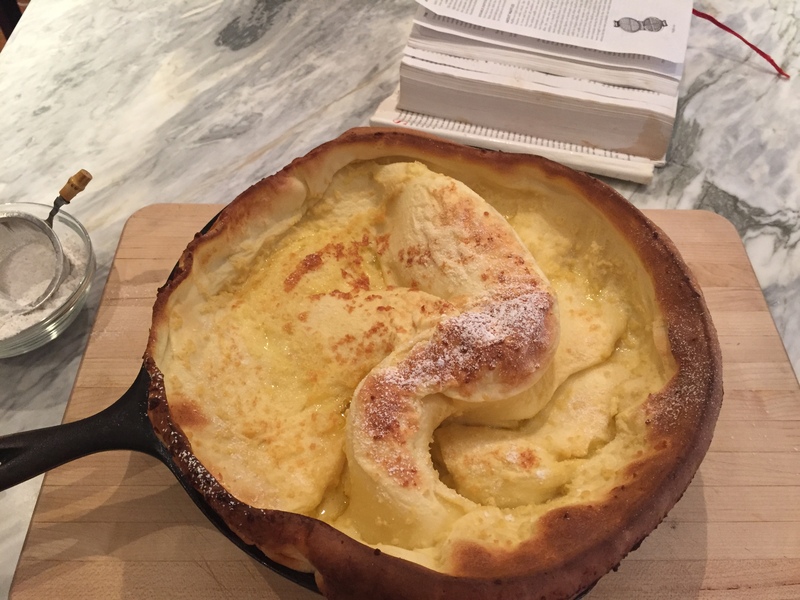 So on this particular Friday night, I made the Puffy Pancake (also known as a Dutch Baby). Five humble ingredients, an ovenproof skillet and 20 minutes are all you need to bring a warm, delicious and dramatic dinner to the table. If you’re feeling ambitious serve with some fruit on the side… sautéed sliced apples in the cold weather months or fresh ripe berries when they’re in season make perfect accompaniments. 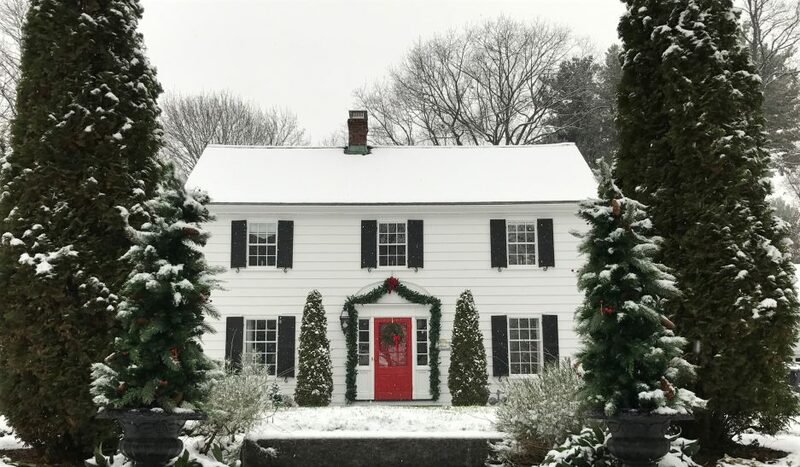 Maple syrup is optional, a dusting of powdered sugar or dollop of jam are just as sweet, and in my opinion even tastier! 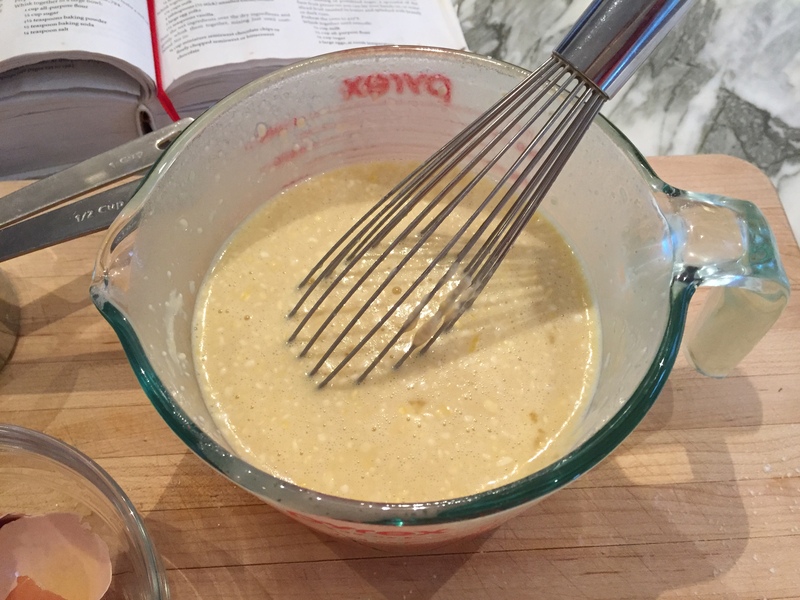 Whisk milk, flour, sugar and eggs together until smooth. 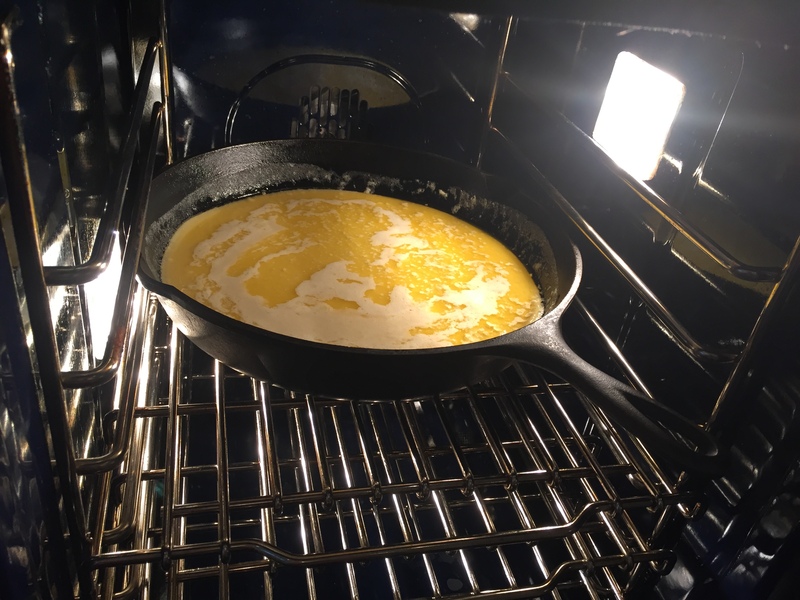 Melt the butter in a 10” ovenproof skillet (cast iron is terrific). 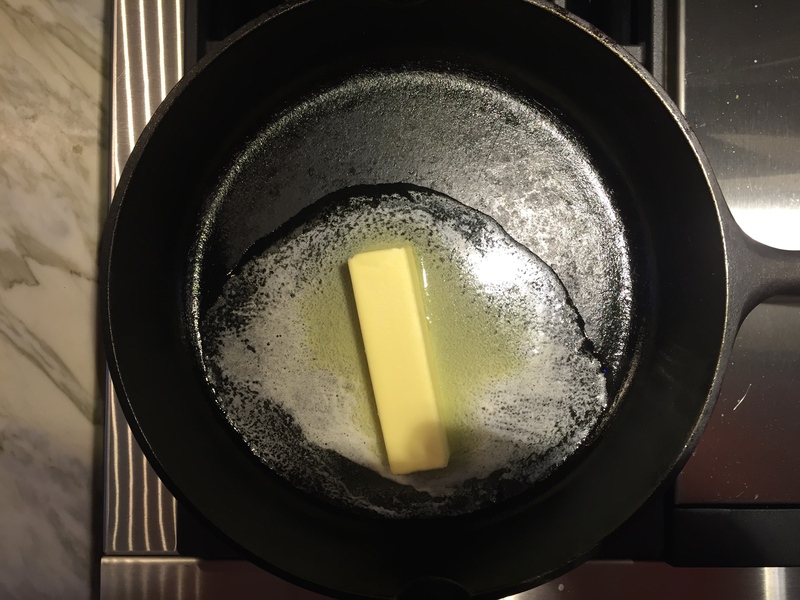 Tilt the pan so that the butter coats the sides. 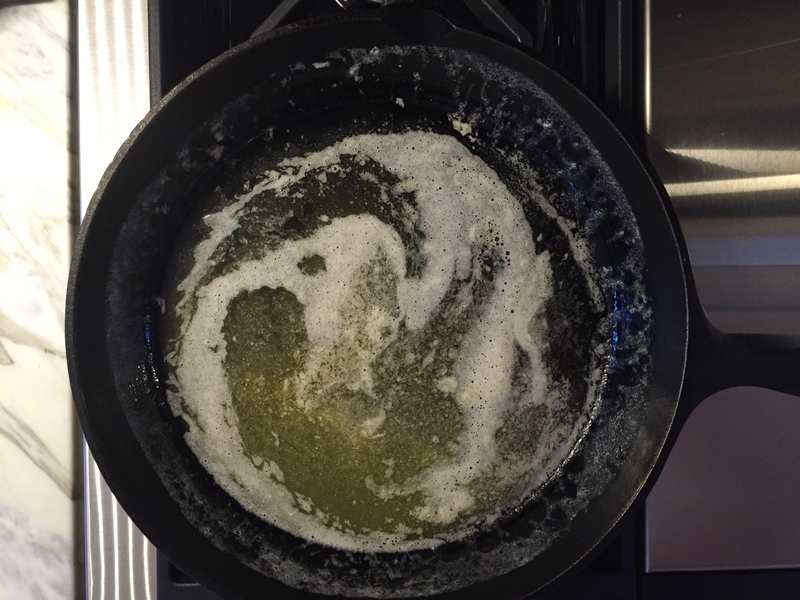 Pour the egg mixture into the skillet and cook, without stirring for 1 minute. 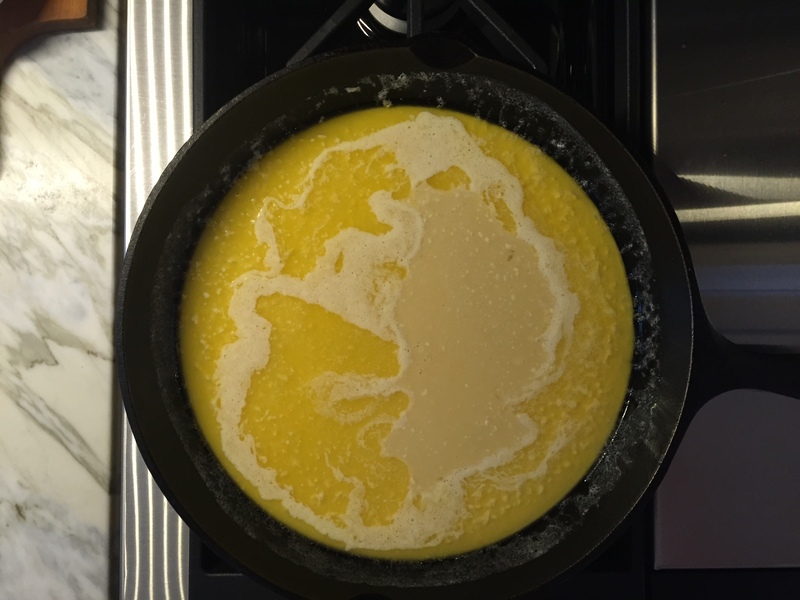 Place the skillet in the oven and bake until the pancake is puffed and golden, 12-15 minutes. Dust with powdered sugar and serve immediately as the pancake loses it’s puff fairly quickly. Voila! 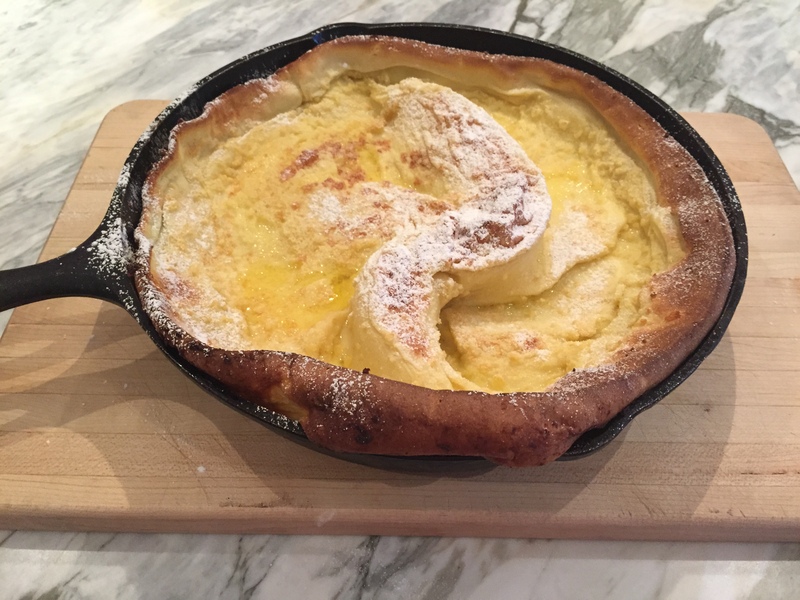 12-15 minutes later, you have the Puffy Pancake. Sprinkle with powdered sugar and serve immediately as it starts deflating quickly. Next > Happy Cinco de Mayo! Thank you! It’s a classic in our house. The puffiness definitely adds some fun drama to the dinner table! yes I am sure! I also love breakfast for dinner! That looks delicious! Must try!